Just saw this on Instagram. Does anyone have an idea of the costs or timelines for each option? I think they also offer one of those too. I think for gateway 2, the APS-MCC course is/was similar which was 10,000 euros. So I would guess something around that. Seems quite high since the 0-fATPL scheme with AFTA is around €75,000. I am still waiting for figures so I’m only speculating. AFTAs current MEP CPL IR MCC is circa €35,000. 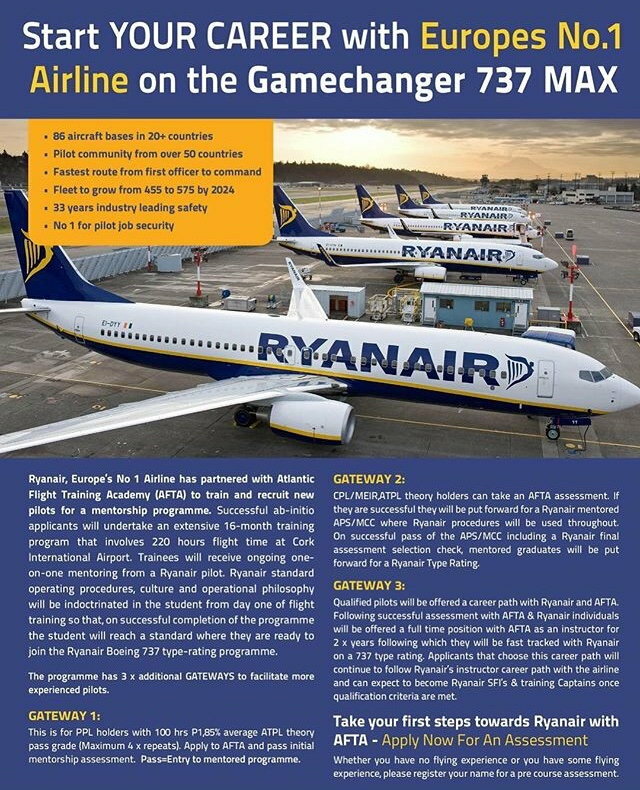 The current MCC has not currently got APS standard approval, though it is in the pipeline as Ryanair have requested this from AFTA. I wouldn’t be surprised if the cost of the MCC part of the course increases in lieu of this. There is the Ryanair bond to pay on top of all this; if going down gateway 1, I don’t think there would be much change out of €40k. I would like to see if NFC is going to do this as well. Would be a lot handier than making the trip to Cork. Lots of ex-NFC guys in Ryanair so I couldn't see why not.